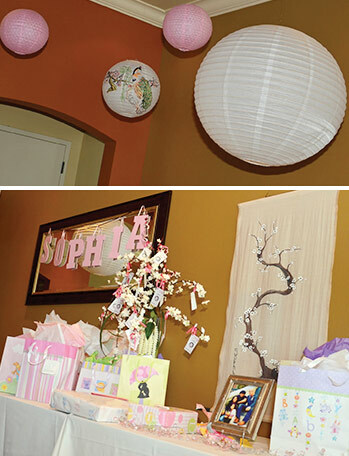 My baby shower was fabulously beautiful!! My friends went beyond my expectations of what I was expecting. The theme was a cherry blossom theme with an Asian flair. Three of my very best friends gave me the shower. I told them the nursery theme was a cherry blossom theme. All the pictures and ideas I showed them were mostly beautiful pictures I googled. They took my idea and gave me an amazing shower. The invitations were photo invitations with a cherry blossom theme. I used photos from my maternity pictures on the invitation. 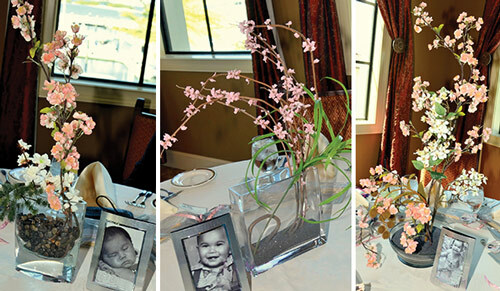 For decorations, my friends had a different cherry blossom centerpiece for each table. 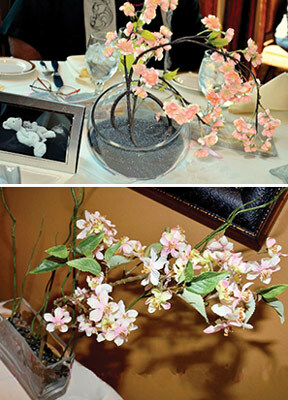 The cherry blossom arrangements were of Ikebana design. Ikebana is an Asian arrangement. Each table also had a framed picture of my older two children as babies. There was also a guest book created using my maternity pictures in it. 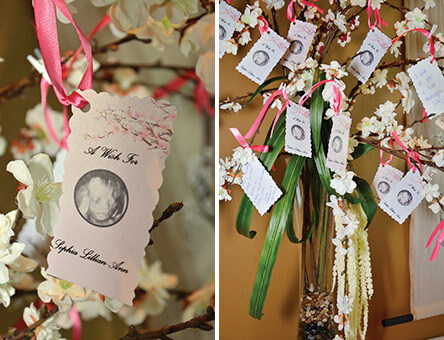 A beautiful wishing tree was made for guests to hang wish tags for my baby girl. The wish tags had a picture of my baby's sonogram picture on the front. My friend painted a beautiful tapestry for the baby's room with a cherry blossom tree. On the guest sign in table there was a photo book I created of my maternity shoot for guests to sign in. Unfortunately, I forgot to take a picture of it. Let me not forget the amazing candy buffet the girls put together. 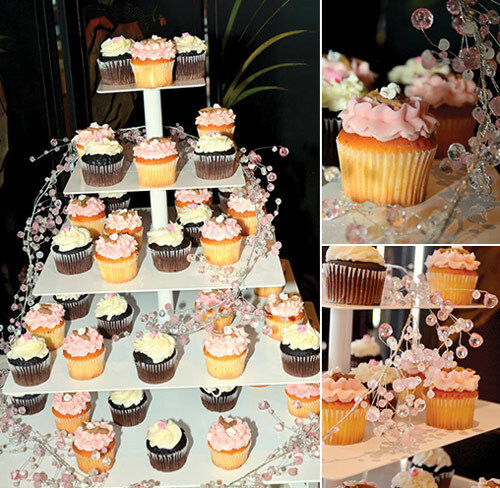 The centerpiece for the buffet was cupcake stand with cherry blossom cupcakes.The candy buffet had jars of candy and cherry blossom cake pops were made. Lunch was a buffet with different pasta salads, fruits and cold cuts. 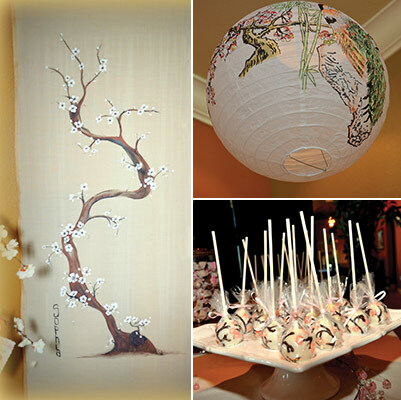 The guests favors included candy bags for them to fill and at each place setting on the tables a gray bag with a cherry blossom fan and chopsticks. The tags on the bags were personalized with a picture of my husband and me. My daughter's table was just her and her BFF. She really wanted to be involved in the planning in the shower. To make sure my 5 year old daughter felt just as important; she made sugar cookies for her and her little friend for their table. 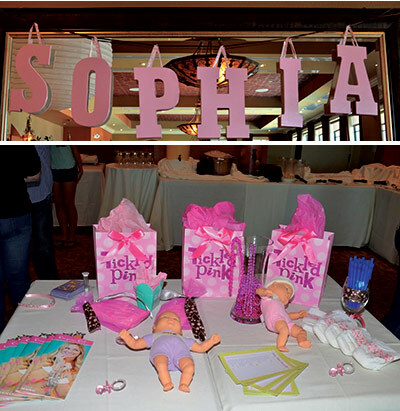 The two girls received customized gift bags with all kinds of goodies in them. 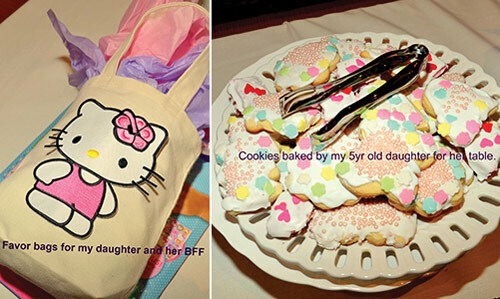 My daughter also received two gifts personalized just for her to show what a great big sister she is going to be. One of my favorite games played was with the husbands that came to the shower. 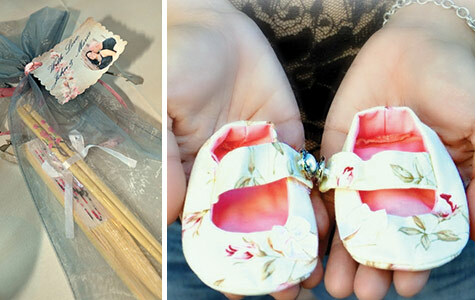 Each husband had to change a baby doll's clothes, diaper, and redress the dolls. Whoever won received fine cigars as their prize. There were so many personal touches that truly made my shower gorgeous!